The following video summarizes what elements are included in a Trial Balance and why one is prepared. The trial balance is the edit phase of our story before we publish the results in financial statements. Accountants use a trial balance to test the equality of their debits and credits. A trial balance is a listing of the ledger accounts and their debit or credit balances to determine that debits equal credits in the recording process. Preparing and adjusting trial balances aid in the preparation of accurate financial statements. Although you can prepare a trial balance at any time, you would typically prepare a trial balance before preparing the financial statements. On the trial balance the accounts should appear in this order: assets, liabilities, equity, dividends, revenues, and expenses. Within the assets category, the most liquid (closest to becoming cash) asset appears first and the least liquid appears last. Within the liabilities, those liabilities with the shortest maturities appear first. 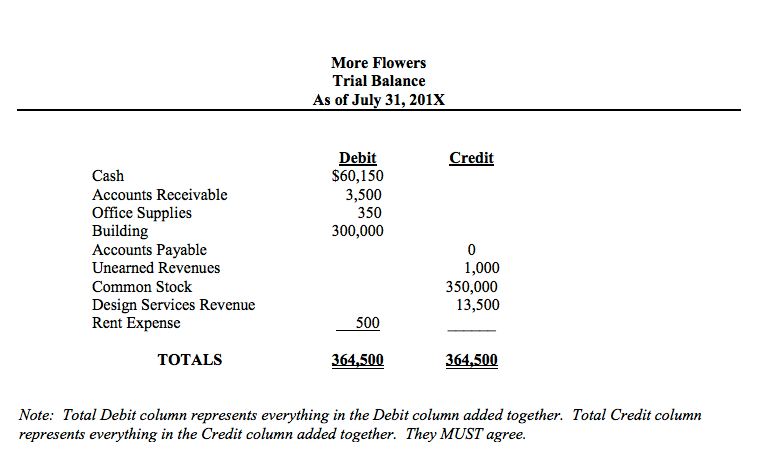 Study the following example of a trial balance for the More Flowers business. Note that totals for the Debit and Credit entries come from the ending balance of the T-accounts or ledger cards. When using T-accounts, if the left side is greater, the account has a DEBIT balance. If the right side is greater, the account has a CREDIT balance. When using ledger cards, you will be calculating the balance after each transaction and the balance typically follows the normal balance of the accounts (remember, normal balance is how we increase an account). The equality of the two totals in the trial balance does not necessarily mean that the accounting process has been error-free. Serious errors may have been made, such as failure to record a transaction, or posting a debit or credit to the wrong account. For instance, if a transaction involving payment of a $ 100 account payable is never recorded, the trial balance totals still balance, but at an amount that is $ 100 too high. Both cash and accounts payable would be overstated by $ 100. While we still have not prepared financial statements, we have captured the activity and organized it into a trial balance. Next up is editing the information before we can publish our story in financial statements. When the trial balance does not balance, try re-totaling the two columns. If this step does not locate the error, divide the difference in the totals by 2 and then by 9. If the difference is divisible by 2, you may have transferred a debit-balanced account to the trial balance as a credit, or a credit-balanced account as a debit. When the difference is divisible by 2, look for an amount in the trial balance that is equal to one-half of the difference. If the difference is divisible by 9, you may have made a transposition error in transferring a balance to the trial balance or a slide error. A transposition error occurs when two digits are reversed in an amount (e.g. writing 753 as 573 or 110 as 101). A slide error occurs when you place a decimal point incorrectly (e.g. $ 1,500 recorded as $ 15.00). Thus, when a difference is divisible by 9, compare the trial balance amounts with the general ledger account balances to see if you made a transposition or slide error in transferring the amounts. Failing to post part of a journal entry. Posting a debit as a credit, or vice versa. Incorrectly determining the balance of an account. Recording the balance of an account incorrectly in the trial balance. Omitting an account from the trial balance. Usually, you should work backward through the steps taken to prepare the trial balance. Assuming you have already re-totaled the columns and traced the amounts appearing in the trial balance back to the general ledger account balances, use the following steps: Verify the balance of each general ledger account, verify postings to the general ledger, verify general journal entries, and then review the transactions and possibly the source documents. Answer the following questions to assess your understanding of the reading. Remember to rate your confidence with your answer: maybe? probably. definitely!